As Halloween approaches and kids are preparing for their annual treat fest night, it’s common to see goblins and other spooky décor inside retail shops, homes, schools and more. But if you or a loved one is seeing ghost like figures in the middle of the night as well as during daytime hours, it’s imperative to schedule a comprehensive eye exam. Blurry vision, ghost images and night time halos around lights all can be warning signs of eye problems. 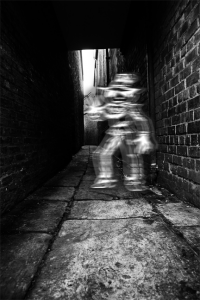 Dr. Stewart Shofner shares top five causes for seeing ghost images and helps solve this paranormal mystery. Cataracts. Cataracts may cause ghost images, usually in one eye only. This is because the clouding of the eye’s natural lens that sits behind the pupil can cause light rays to scatter in different directions, creating multiple but incomplete images, especially when you look at lights. Cataract surgery usually will eliminate this ghost image problem. Corneal irregularities. Ghost images can be caused by such conditions as keratoconus (cone-shaped corneas) and corneal dystrophies (deterioration of the corneal structure). Many corneal irregularities can be helped when you wear special contact lenses or use dry eye treatments such as eye drops or punctal plugs. Some people with this condition may need surgery, such as a corneal transplant or Intacs implants. Dr. Shofner or your local eye doctor can help you figure out the best treatment for your individual problems. Dry eyes. Severe dry eyes, such as Sjogren’s syndrome, can cause ghost images due to insufficient or poor quality tears. Many people who suffer from dry eyes can be helped by eye drops (over-the-counter or prescription), punctal plugs, eye vitamins, lid hygiene techniques or a combination of all these treatments. Dr. Shofner recommends patients experiencing dry eye symptoms to schedule a dry eye workup and treatment. Refractive surgery. Those who have had LASIK vision correction surgery, PRK or any refractive surgery to improve visions without glasses or contacts may experience double or ghost imaging due to cornea changes. This problem usually clears up within weeks or months. But some patients may need to use eye drops for a while. Dr. Shofner has performed over 30,000 LASIK/PRK vision correction surgeries and 10,000+ cataract surgeries. He strongly urges his patients to prevent age-related eye problems by maintaining a healthy lifestyle, incorporating vision supplements along with good nutrition and scheduling routine eye exams.